Laurie and Charles Dawson own and run Traditional Teas From The Domestic Goddess a tea retailing and education business in Everson, Washington. 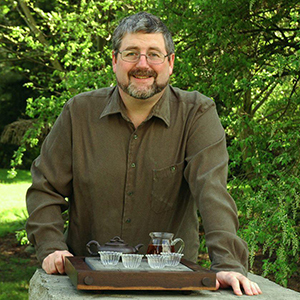 Charles and his wife Laurie started Traditional Teas to share their love of traditional tea culture in the coffee-dominated Pacific Northwest and to grow the local tea community, but also to have an excuse to share tea all day long with anybody willing to sit down for a tasting. They are constantly seeking out new variations of traditional tea culture to learn from and share. They are the founders of the Whatcom Tea Enthusiasts Association, a North Sound tea education club. Charles was also a competitor in the 2012 Tea Infusion Challenge at the World Tea Expo.